Get the facts on fat and weight loss. It's not just about calories in and out. Most people in their adult years have spent most of their lives being bombarded with information on how to achieve the perfect body and lose weight. Low fat products are everywhere. Taking fat out of a product changes the taste and to combat this sugar is added. Everything we have ever been told about dieting is, for the most part, being proved incorrect. We fixate on calories and low fat instead of health. Losing weight in a way that is sustainable is not an overnight goal. It’s a lifestyle change. The human body is a complex machine – it is not as simple as calories in and energy out. Your set point is the weight your body naturally maintains. Set point is controlled (principally) by your metabolism. Metabolism is affected by your muscle mass. People who exercise regularly and have a higher muscle mass will naturally maintain a lower body weight than people who never exercise. Exercise alongside a healthy, sensible diet is essential. Most diets contain a low fat, high carbohydrate plan. Carbohydrates are essentially sugar. The body burns through sugar quickly leaving you feeling unsatisfied and more likely to binge on junk food. Your body is very particular about the level of sugar in your blood. When you eat a high carbohydrate meal, your blood stream is filled with sugar, the easiest and safest way to clear this sugar is to store it in fat cells. Sugar in the body has one purpose – it is an energy source. If you lead a sedentary lifestyle and sit at a desk all day, you don’t need that level of energy so it is stored for use at a later date. Fat, on the other hand, is used for all sorts of body maintenance. It’s used to build cells, protect organs and is essential in utilising fat soluble vitamins. As your body has so much to do with fat it rarely stores it for later. Eating a diet with the right amounts of fat and protein will make you feel satisfied and reduce binging. In 1961, the American Heart Association found what they thought was a link between dietary fats and heart health. They concluded that a low fat diet was best for heart health (this is not proven). The general public and food production companies adopted this low fat approach. Food companies removed fat and added sugar instead. Fad diets work whilst you stay motivated to rigidly stick to it, however you will eventually stop and return to your ‘normal eating’ patterns. The weight then piles back on and the cycle begins again. 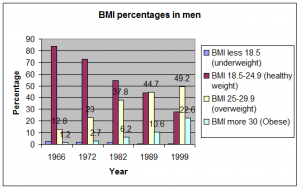 Looking at the BMI percentages in men and women in the UK over the last 50 years, we can see a worrying trend. 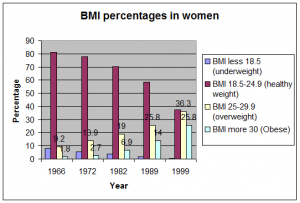 We can clearly see that since the sixties there has been an increase in the percentages of people who are obese and overweight. The liver is one of the most important organs in the body. The liver is responsible for filtering out toxins. Fat cells within our body act as a storage spot for fat as well as toxins. Your body doesn’t like to have toxins floating around in the blood, if the liver is overwhelmed, you will store toxins amongst your fat cells. Have you ever been on a diet and gotten to that point where you plateau? You just can’t lose any more weight and end up feeling unmotivated and fed up? Your body is very good at protecting itself, if your liver is not able to cope with any more toxins, your body will not burn fat cells that contain toxins. Burning these fat cells releases toxins that your body cannot handle at that time. The correct diet for you is going to be as unique as you are. 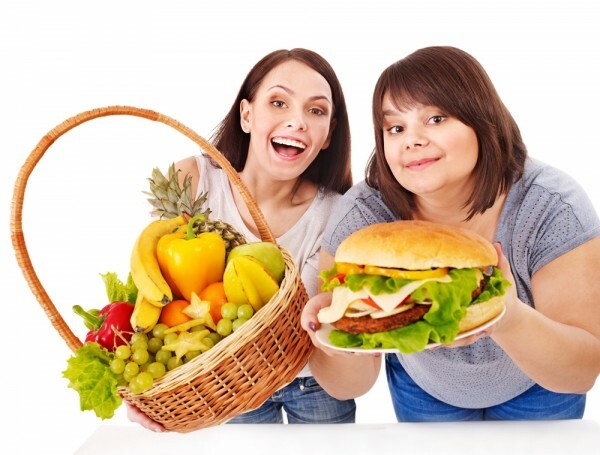 A good diet will focus on health with weight loss being an added bonus. You should feel energised and satisfied on a healthy eating plan and watch your body return to its healthy set point.